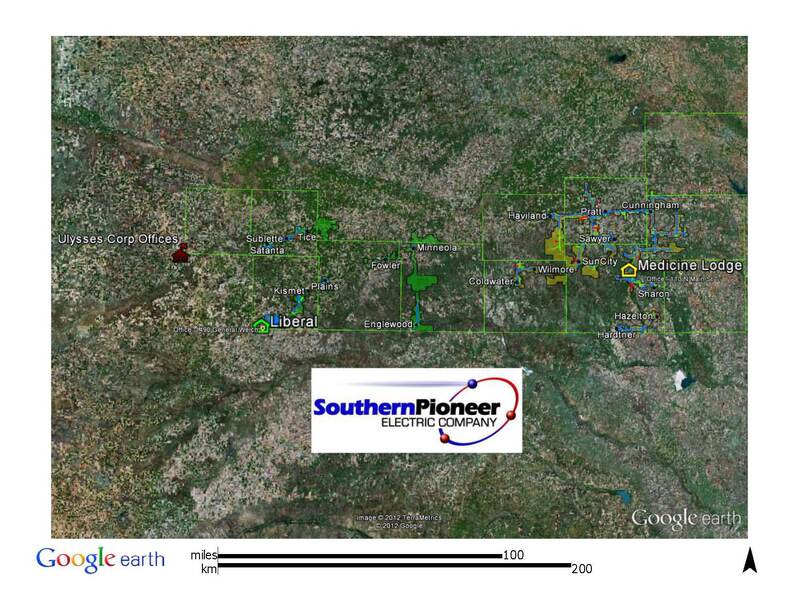 Southern Pioneer Electric Company is a wholly-owned subsidiary of Pioneer Electric Cooperative, Inc. Pioneer Electric joined five other electric cooperatives to form Mid Kansas Electric Company, LLC for the purpose of purchasing Aquila’s Kansas Electric Network in 2007. SPECO service territory. Click to enlarge. The Kansas Electric Network, commonly known as WestPlains-Kansas, includes a customer base of 70,000 located in or near 176 communities in 32 counties in central and western Kansas. The Kansas Electric Network operates 1,083 miles of high-voltage transmission line, and 5,348 miles of distribution line. The network also includes 608 megawatts of natural gas, coal-fired and wind generating capacity at six central and western Kansas locations. Southern Pioneer Electric Company serves approximately 17,200 consumers and operates in nine counties and 34 communities. SPECO service territory stretches east from Liberal to Medicine Lodge and north to Pratt and back west to Greensburg, Kansas. Southern Pioneer Electric Company’s Customer Services offices are located in Liberal and Medicine Lodge with corporate offices in Ulysses, KS. Our Mission is to be the energy and service provider of choice to our customers.